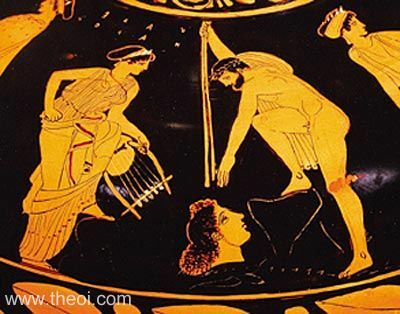 A man reaches forward to recover the severed head of the poet Orpheus which has washed ashore on the island of Lesbos. The head is miraculously alive and uttering prophecies. Beside him stands the poet's divine mother, the Muse Calliope, holding a lyre.